Every organization has different needs and aspirations from the strategic planning process. That’s the beauty in planning; you get to create a plan that’s the right fit for your organization and where you want to be in the future. It’s why we love doing what we do. Treating strategy as evergreen. High performing organizations see strategy less as a plan and more of a direction or an agenda for their decisions long-term. It’s less about creating a plan that’s distinctly tied to a planning calendar, but more focused on creating continuous process. Valuing flexibility. The path forward isn’t always a linear one. Creating flexibility in your organization – and the ability to adequately absorb that flexibility – empowers your team to shift when it’s necessary. Thinking of strategy as a portfolio of options, not bonds. Think of your plans like a portfolio of options. As long as your strategy is “in the money,” you can continue to invest in it. The moment it walks “out of the money,” you can shift focus to another option that might have a higher yield. Creating responsible mechanisms. Any strategy has the opportunity to go awry. But successful organizations put warning buoys in place to know when something is going wrong or there has been a significant shift in your external environment. Once those warning buoys have been tripped, it’s important to have a mechanism and contingency plan in place when you have to enter uncharted territories. Reacting quickly and effectively is the key to success. Testing and learning, then test some more. Think of planning as a series of micro-sprints helping your organization test a hypothesis, learn from the success and failure, and start the process again. So, what’s the point of reviewing these traits of successful execution and how do they tie to your own strategy review cadence? In short, these traits of successful execution can only be achieved through timely, consistent strategy reviews purpose-built to drive the ongoing focus on your plan. We talked about implementation models last week, so this week we are focusing on selecting your review cycles and cadence. In the same way a strategic plan is designed to meet your organization’s individual needs, your implementation and review cycles are not a one-size fits all approach. Every organization needs something different from the planning and implementation process, and it’s up to you and your leadership team to help create the cadence of accountability that meets your needs. So, what are your options? 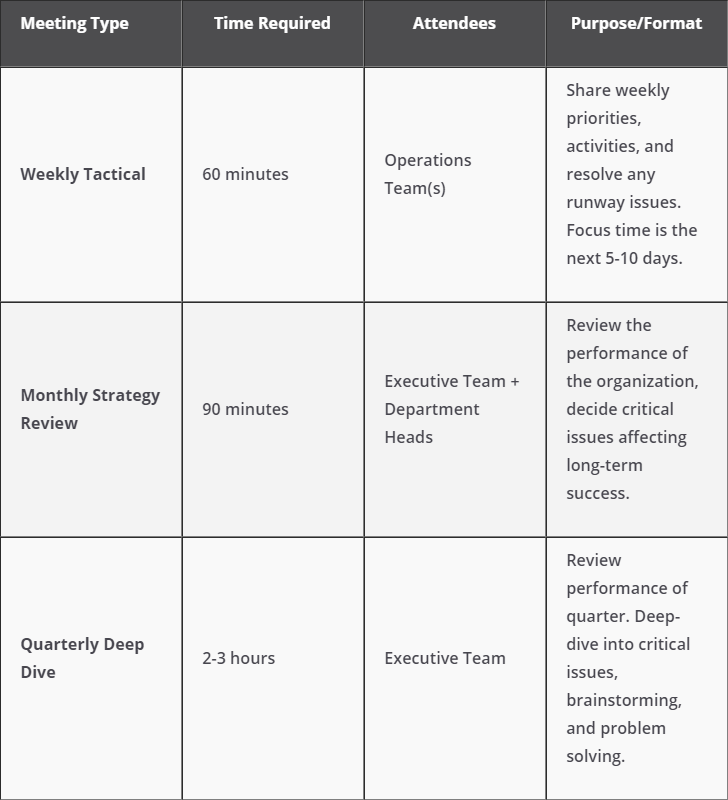 Here’s a review of the different types of strategy reviews, their structure and purpose, and our recommendations on when to use them. Starting with the shortest time period, weekly strategy reviews shouldn’t just be strategy reviews. Instead, we recommend integrating a component of the plan review process into your regularly scheduled weekly tactical meetings. These weekly tactical meetings cover the operational elements and weekly priorities of your team, their activities, and what needs to be accomplished during the next 5-7 days. But, adding a strategy component to your weekly tactical meetings can help make the connection between your team’s day-to-day activities and what your long-term focus is. We recommend using your plan as a guiding influence to help align your short-term priorities with your long-term focus. 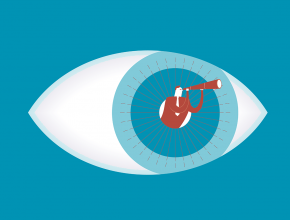 Why choose weekly – Integrating your “big picture” strategy into your weekly tactical meetings keeps the long-term focus front-and-center to connect your entire organization to the plan. It helps achieve a daily line-of-sight. Monthly strategy reviews are purpose-built sessions to review the performance of the organization and decide what are the critical issues you need address in the next 30 days. We recommend monthly reviews because it shortens the time frame to refocus everyone’s attention and allows your team to be crystal clear about what they’re accomplishing every month to achieve your annual goals and long-term vision. Why choose monthly – Monthly reviews shorten the cycle in which you review your plans performance. It also helps keep the plan front-and-center but gives your team the visibility they need to see if the actions they’re taking are performing and how you might need to adjust. Similar in format and structure to a monthly strategy review, quarterly reviews are sessions designed to review your performance and articulate focus for the next 90 days. We consider quarterly strategy reviews table stakes when it comes to consistent execution. The absence of quarterly strategy reviews is a surefire way to lose focus on how your organization is trending towards its goals, annually and long-term. Why choose quarterly – Quarterly reviews allow your team to review what you’ve done, what’s working, what’s not, and what the big focus for each team and the organization needs to be for the next 3-6 months. We always say quarterly reviews are the backbone of the planning process, and we stand by that statement. In this mini-series, we covered the most common approaches to execution and strategy review cadence. What’s most important to remember is that we can’t tell you what the perfect approach is for your own organization. It’s about weighing the pros and cons of each and finding the approach and cadence that’s the right fit for your organization. Bonus – need help with your strategy review agendas? Download them below!